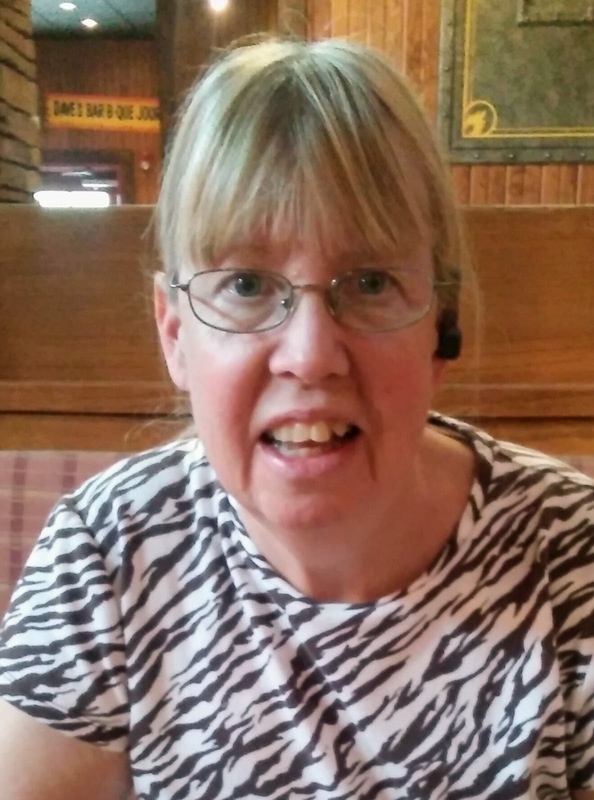 YumaBev has Parkinson's Disease and a sense of humor! 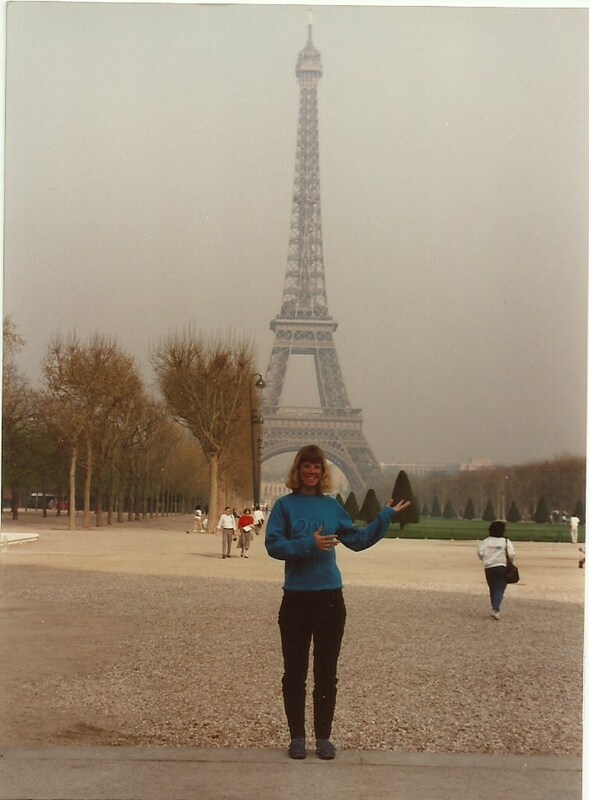 Funny stories and helpful tips about her life with Young Onset Parkinson's Disease. Come laugh with her as she fights Parkinson's Disease with humor. After almost two years of editing, the Lights, Camera, Action video my Wonderful Husband and I did about Medtronic DBS therapy for Parkinson's disease is finally available to be viewed. I had watched some of the other Patient Stories online and was expecting mine to be 1 or 2 minutes long. I wondered which parts of the hours and hours of filming they would use. A lot of what they filmed that day was a blur. I remember talking about my DBS experience and how they kept having to stop because the landscapers were making too much noise outside. I remember laughing and being silly and talking about my Parkinson's Humor blog. 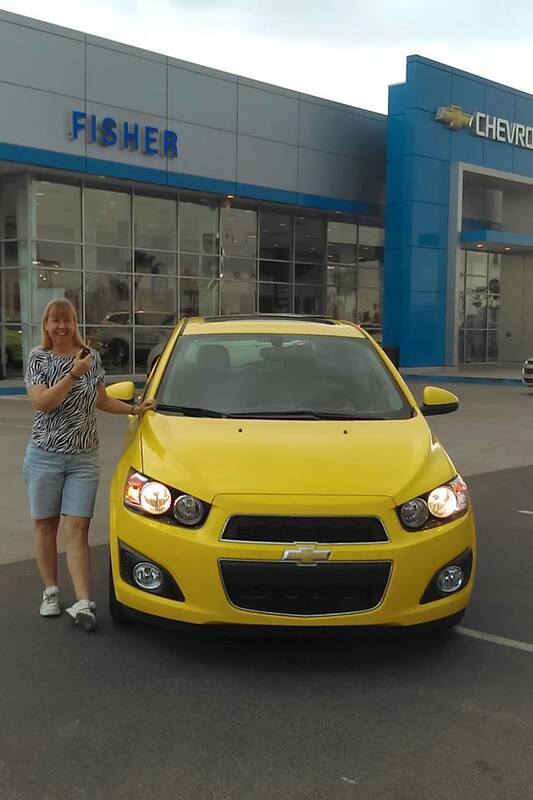 I remember circling around and around the hotel trying to get a good shot of me driving my bright yellow Chevy Sonic. But most of all, I remember being able to share my story in my own words, just like I do in my blogs. I was expecting a 90-second video, instead they made an eight minute movie that tells the love story of me and my Wonderful Husband. Enjoy it. You can also find the video by searching Beverly's DBS Story on YouTube. Clicking on the colored words will open a new window and take you to a different story or website. Several years ago, I wrote a story where I used rechargeable batteries as a way to describe what life is like with Parkinson's disease. Using my warped sense of humor, I changed the famous Energizer Bunny to the Energeezer Parkie. It thought it was a pretty good analogy. 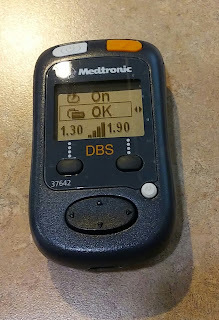 Once I had DBS surgery, my 'Parkie' battery was pretty close to 100% every day. I knew my Medtronic Activa-PC DBS generator battery would need to be replaced some day. The average lifespan is 3 to 5 years. Mine was six years old in October 2018. At the beginning of 2016, my battery level was 2.97v. At the beginning of 2017, my battery level was at 2.91v. At the beginning of 2018 it was 2.85v. It was averaging a drop of .06v a year, so I figured I'd have several more years until it reached the ERI (Elective Replacement Indicated) warning you get when it drops to 2.61v, I was wrong. I had been in the habit of checking my battery level using my patient programmer about every three months. April was 2.83v and July was 2.81v, right on target. So you can imagine my surprise when I checked it at the end of October 2018 and saw that it was down to 2.76v. I started checking it monthly, then weekly and now daily and I wasn't liking what I was seeing. The amount of time between voltage drops was decreasing. As of today, January 21, 2019, it's now at 2.69v. That's a drop of .07v in less than three months. If the voltage drop continues to accelerate, I will get the ERI warning in a few months!!! My neurosurgeon, Dr. Norton is in the same office as Dr. Bradley, my Movement Disorder Specialist and I have an appointment with her in mid-March. I have already contacted Norton's assistant because I didn't want to wait until March and then find out that he's going to be on vacation or something else that would make him unavailable. Norton's assistant said they could get me on his surgery schedule within two weeks, but I should call if I get the ERI warning before my March appointment. Looks like the Energeezer Parkie will soon be getting a brand new generator. The generator won't stop working when the ERI warning appears. There's a built in cushion of time, it doesn't stop working until it gets to 2.20v. 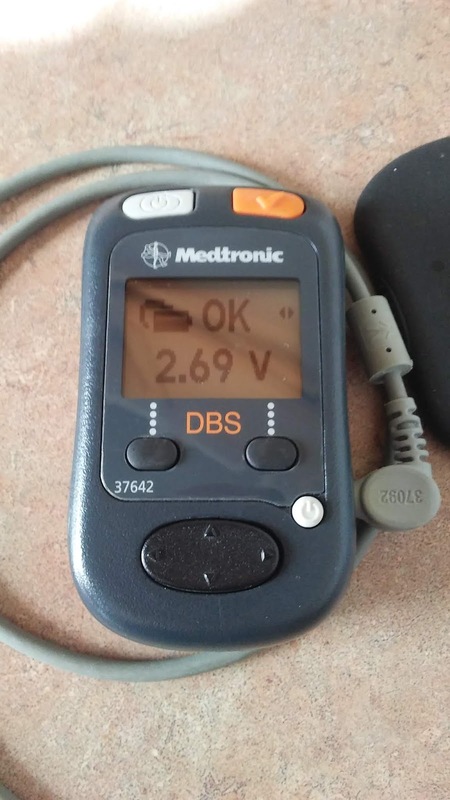 If you have a Medtronic Activa DBS generator and don't know how to check it, click on the link above. You don't want it to suddenly stop working. It has now been SIX years since I joined the DBS "Holes in My Head Club" for Parkinson's disease and I bet you are curious as to how am I doing? There isn't much change from last year. My DBS device settings are exactly the same as they were last year (1.30 left, 1.90 right) and my generator battery level is 2.76V which is lower than I expected, but still a long way from the 2.59V replacement (ERI) warning. I have reduced my intake of carbi/levodopa to one half of a 25/100 pill per day. Yes! You read that correctly, I have LOWERED the amount of Parkie meds I take daily. My sense of humor is still there and I try to find things to laugh about every day. My slowness of movement and rigidity are well controlled. I have almost no visible tremor, except first thing in the morning. I am happy that I have had such amazing results from my DBS experience and am thankful to Medtronic for making this therapy a reality. If you want more details, read last year's update: DBS Year Five. The notice arrived in early May. It was a juror questionnaire form, asking me to respond online. I could have asked one of my doctors to write me an excuse but I did not. I think I would like to serve on a jury. I never have. 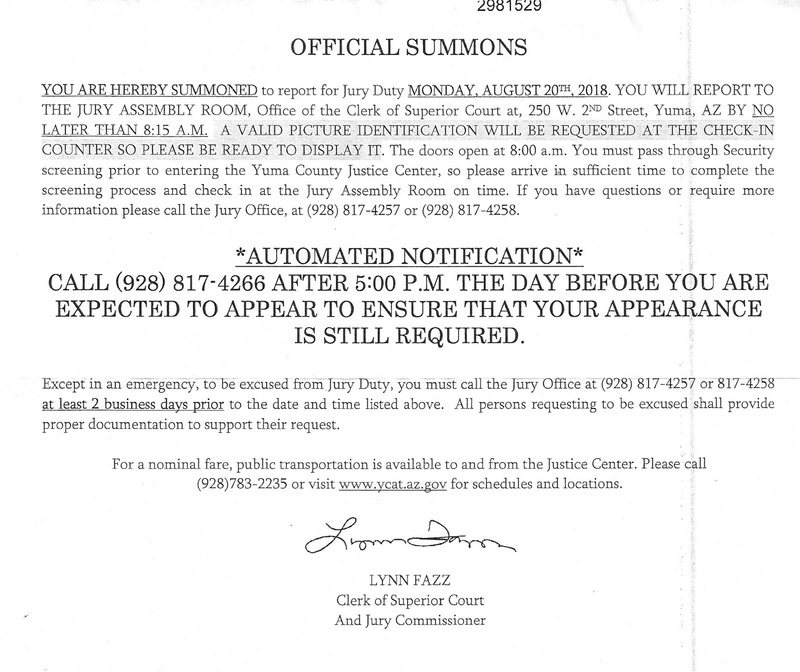 The notice said I may be called any time after July 1st. 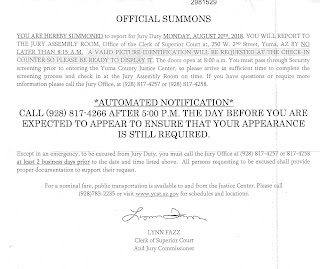 On August 11th, I get my Official Summons in the mail. I am to report at 8:15 AM on August 20th. I am a tad bit excited. Maybe it will be a murder trail, or a bank robbery or something else interesting. Soon I realize that I will have to get up early enough to take my thyroid pill on an empty stomach, wait 30 minutes to eat my breakfast, take my Parkinson's disease pill and get dressed in business casual type clothes. My typical hot weather attire of shorts and tank tops are not allowed. I also hadn't factored in the thirty minute drive down there or what I was going to do about my second meal of the day. On a normal day, I eat breakfast around 10 AM and then Wonderful Husband cooks us a big meal which we eat about 2 PM and at night we have a salad, or cheese, or snack on some fruit. 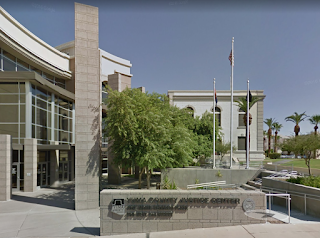 All of a sudden, Jury Duty was losing its humorous appeal. The morning comes, I get up when the alarm goes off at 6 AM, get ready, and pack a peanut butter sandwich and fill my Yeti cup with ice and water. Since Wonderful Hubby and I are together 98% of the time, we only have one cell phone, so I leave it at home with him. The other 2% of the time, one of us is using the bathroom (hee-hee.) I park in the courthouse garage, grab my sweater (in case it's cold in court) and walk to the entrance. It's 8 AM and already 90° outside. I walk through the entrance doors and feel like I'm at the airport screening. People are taking off their belts, watches and emptying their pockets. Bags, briefcases and purses go through the scanner and people walk through the metal detector. I stand to the side and tell them I have a pace-maker type device. It's easier than trying to explain my DBS implant. I get the hand wand treatment instead. I show my ID and sit down in a large room with about 250 other people. There are TV screens everywhere, all tuned to a channel devoted to houses; remodeling, selling or buying bigger homes. After 10 minutes of that, I am bored, so I people watch instead. There are twice as many men than women and more in their 40's than in their 20's. I see one obviously very pregnant lady with a toddler in tow, two people on crutches and only a few with gray hair. There are quite a few with tattoos, piercings and bright hair colors of blue, green or purple. A bailiff comes in, asks everyone to stand and introduces the Judge. The Judge has us all raise our right hands and puts us all under oath. He then tells us it will be a medical malpractice civil trial (yuck) and they hand out forms for us to fill out. After we fill them out, we can leave. If we don't hear anything, we are to report on the date listed on the form. I realize now that I have a problem, my handwriting is so terrible, I can't even read it myself. Most of the pages have yes or no boxes to check, so that's okay. Then there is a page with the trial dates listed; three whole weeks in September and early October. They want to know if I am unavailable on any of those dates and if so, why. I don't have our cell phone with the calendar on it, so I don't have a clue what may be scheduled a month from now. I can't remember what I'm doing tomorrow or next week without checking my calendar! I see the first Monday in October is listed and realize that's our Parkinson Support Group meeting day. I manage to scribble why I can't serve on that date. I also scribble that due to Parkinson's, I'm not sure I could be in court every day, from 8 to 5 for three weeks in a row. By the time I finally get the form done, all of the other 250 people are in a line to leave. I am the very last person to hand my form in. I ask the bailiff to make sure he can read my Parkinson's scribble. It's only 10 AM and I'm on my way home and I am completely exhausted. What was I thinking?? I should have asked my doctor for a medical excuse. There's a huge difference between being at home all day and being in court all day. Once I get home and check my calendar, I find out my step-daughter is coming to visit, I have a Doctors appointment and a teleconference all scheduled during those three weeks of trial dates. All I can do is wait and see. If I have to go, I will try to explain to the Judge why I didn't fill out the form when I was there. The phone rings a week prior to the trial start date, I don't recognize the number, so when the man at the other end begins to mumble quickly, I just hung up. I did a Google search on the number and realized it was the Court. I called back and was told that I did NOT need to report. Problem solved. Whew! As much as I want to fulfill my civic duty and serve on a Jury, the reality is I can not do it, either physically or mentally. I would not be able to show up on time, for multiple days in a row and be able to stay alert. I would not be able to take handwritten notes and I'm no longer capable of remembering complex details. When it came to deliberating, I would not be able to express my thoughts clearly and would probably come across as being drunk, stupid or both. Looks like the Justice system will have to get along without me and that's okay. A criminal trial might have been interesting. A medical malpractice trial would have been sad and possibly made me angry. Neither would have been funny and if it doesn't involve humor, I'm okay with missing out. It's no secret that I like to drive. Even though I have had Parkinson's disease symptoms for well over 20 years, thanks to Medtronic DBS, I am still a good driver. Mr. Brooks is a friend of ours. 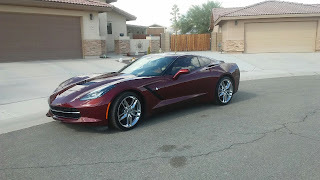 We met him when he joined the Corvette Club several years ago. He's been single all of his 85 years and he was an only child, so he has no family. He also has a great sense of humor. When asked if he has any children, he winks and says, none that I know of. Mr. Brooks was a rescue crewman in the Navy, which meant he spent most of his Naval career flying high in the air in a helicopter. Just prior to his retirement, the helicopter he was in, crashed. Over the years, he's had replacement parts put in his ankles, knees and shoulders, all damaged in the crash. After a 30-year military career, he went to work as a policeman at the US Army Proving Ground here in Yuma until he totally retired about 20 years ago. In the years that we have known Mr. Brooks, he's had to have all of his replacement joints replaced again. 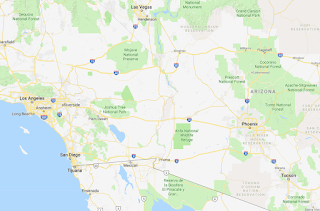 Usually, Mr. Brooks would drive himself to the Veterans Administration (VA) Hospital in Tucson, Arizona (250 miles away) and they would replace the part, then keep him there until he was well enough to drive himself back home. It seems like he's had something in a brace, cast or sling the entire time we have known him. Sometimes we would pick him up in my car and take him to the Corvette Club functions, so he was used to my driving. In the Fall of 2016, Mr. Brooks was having a problem with his left ankle and it wasn't something the VA could fix. It would have to be outsourced, and he would need a driver. He asked me if I would be willing to drive him to a hospital in Tucson and drive him back home the next day. He would gladly pay for my hotel room. My Wonderful Husband and I said yes, as long as his surgery date didn't interfere with my own Tucson appointments. As it turned out, his surgery was scheduled for the same day as my appointment with Dr. Bradley. He needed to be at his hospital by 5 AM on Monday and my appointment wasn't until 1 PM. I was also scheduled to speak to the University of Arizona Medical School students early Tuesday morning and he wouldn't be released before noon, so all would work out just fine. There was a small problem though. It was Thanksgiving weekend and there were no reasonably priced hotels to be found in Tucson and we'd need two rooms on Sunday night and one for Monday night. I contacted my Parkie friends Ken and Lisa and asked if all three of us could please stay at their Tucson home. I knew they were out of town for the holiday and Wonderful Hubby and I had stayed at their house in the past. Luckily, they said yes. So, we packed our bags and I drove my car into Yuma to pick up Mr. Brooks, and we headed for Tucson. We got the keys to our friends house from their neighbor and then drove the route to hospital. I didn't want to be trying to find my way in the early morning darkness. We ate what Mr. Brooks jokingly referred to as his last supper, watched some football on TV and retired to our rooms early. I set the alarm for 4 AM and woke to heavy rain and very cold temperatures. Fortunately, we had parked in the garage. My Wonderful Husband hates hospitals, so I left him sleeping. Mr. Brooks was ready early, so I drove slowly to the hospital. I was glad we did a trial run in the daylight the day before. Everything looked different in the darkness and rain. I stayed with Mr. Brooks until they hauled him away on a gurney, made sure the staff had my cell phone number and that I had permission to check on him. Then I drove back to the house and went back to sleep. 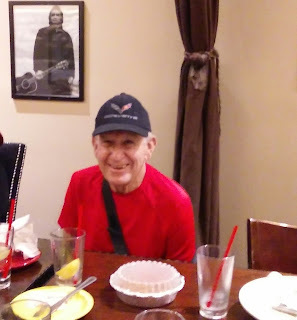 After my appointment with my Parkinson's specialist and a quick chat with my DBS neurosurgeon Dr. Norton (they work at the same place), Wonderful Hubby and I went to see Mr. Brooks at his hospital. We walked into his room to find him crawling across the floor from the bathroom. He wasn't able to reach the nurse call button, the urinal or his crutches and he said he had to go. I scolded him and we called a nurse to help get him back in bed. And then I scolded the nursing staff as well. We stayed until they brought him dinner and then headed back to the house, stopping for something to eat on the way. Tuesday morning, we returned the house keys to the neighbor. I went to speak to the Medical School students, then we drove to the hospital, picked up Mr. Brooks and headed back to Yuma. We made sure he was settled in at his house and came home. This was the first of many trips to Tucson or Phoenix that I would make with Mr. Brooks. After that first trip, Mr. Brooks would drive one of his cars (he has several) to my house and then hand me the keys and I'd drive the rest of the way. Mr. Brooks always tells the staff at the Doctors office or Hospital that I'm his driver. "Doesn't everyone have a pretty blonde chauffeur?" Mr. Brooks says. When they ask me who I REALLY am, I say I'm his chauffeur. As we are cruising along, Mr. Brooks tells stories about his Naval career. He was part of the ocean pick-up crew for one of the Apollo space missions. He did mountain rescues in the Alps and while there, he travelled all over Europe in an Austin-Healey. He's lived an adventurous life and is still enjoying every day. Mr. Brooks newest car, and YES, I have driven it too! I know he must be in pain every day and yet he never complains. We just got back from an overnight stay for another early morning surgery on his left ankle. They had to take a screw out because it was bulging through the side of his calf. This was the third time Mr. Brooks had a 'Screw loose!' as he likes to tell people. I hope this is the last of his replace the replacements surgery and that he's finally done. It takes a lot of planning to make these trips. I make sure I know exactly where I am going and memorize alternate routes, just in case. I'm glad I can still drive Mr. Brooks. I'm not normal and I am not ashamed to admit it. 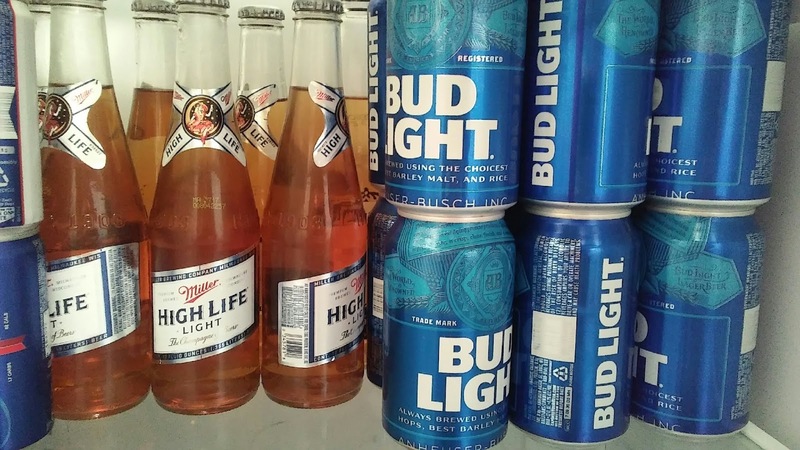 I prefer to hang out with the guys. If given a choice of getting dressed up and going to a fashion show luncheon with a group of ladies OR putting on old jeans and a t-shirt and watching the neighborhood fellas work on a project, I'd rather watch the guys. When I signed up for the World Parkinson Congress Buddy program back in 2016, I requested a male buddy; single or married, since my Wonderful Husband would also be attending. I got paired up with a lady from Israel, with 5 children and 6 grandchildren. (I have no children of my own.) She was into crafts, makeovers and fashion. As far as I could tell from our emails to each other, the only things we had in common, besides Parkinson's disease, was our age, DBS and a good sense of humor. We never got to meet in person, because she went shopping every chance she could. My parents had three boys and two girls, but my Dad would tell everyone that I was his favorite son. He taught me to use all his tools, manual and power. He made sure I could change a flat tire, change my own oil and put new belts on my first car, a VW Bug. When I married my first husband, it was ME who had to remind HIM to check the oil level in the car. And it was ME who had to find a replacement engine when he did not add oil when visiting his grandmother and the engine seized up on his way back home. 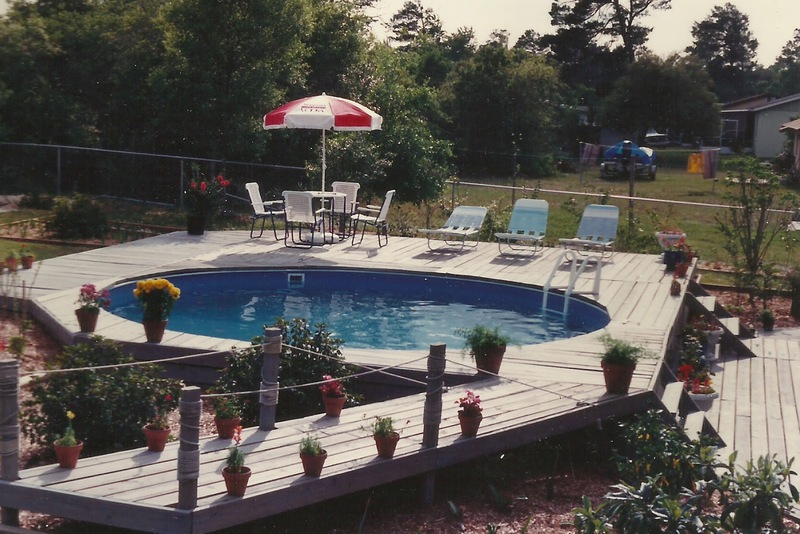 When I married my Wonderful Husband, he was aware of my tom-boy mentality and was glad to have a helper when we decided to re-do the back yard of our first house. 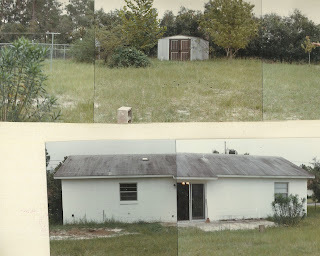 Here's a before and after. I never shied away from doing the "men's" stuff all the years we were traveling around in the RV. I helped with sewer hoses and hooking up to the truck. I wriggled my way into a kitchen cabinet to put in a new fuse when the old one blew. If one of the other campers was working on his truck, I was right there with the guys learning. Even now, I am a pretty decent mechanics mate. I know the difference between a crescent wrench and a box wrench. 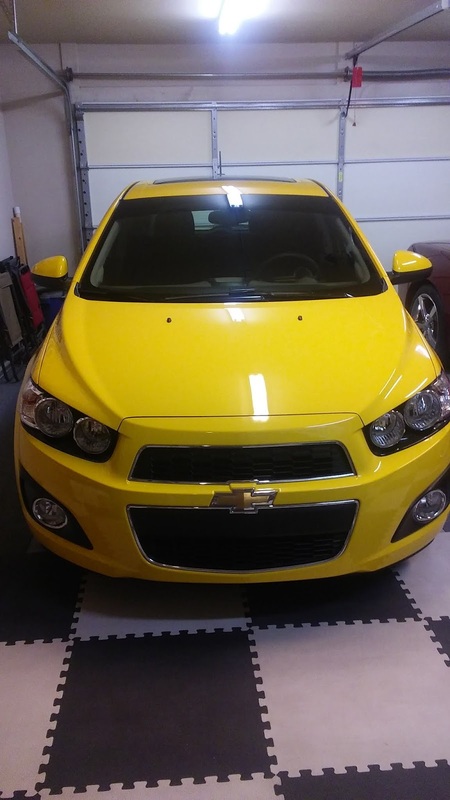 When my bright yellow Sonic was making a groaning noise whenever I slowed down or turned, I went online and figured out what the problem was; front sway bar links. The mechanics at the local Chevy dealer thought otherwise and ended up replacing the strut bearings and then the steering assembly (under warranty) before they finally listened to me and fixed it correctly. Parkinson's has really affected my dexterity, so I can no longer fix things myself. However, that doesn't stop me from still wanting to learn. This explains why, every Saturday morning, I am at the Coffee Bean with a bunch of men, including my Wonderful Husband. 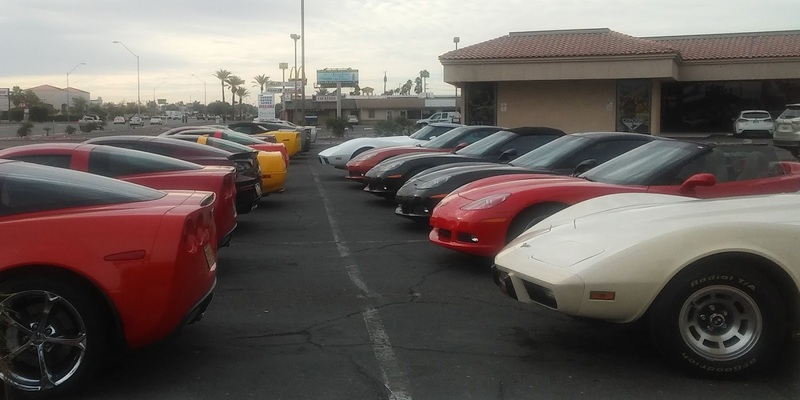 This eclectic group of Corvette owners have been meeting here every Saturday morning for over 10 years. Today there is a large number of guys and an equally large number of Corvettes parked out front. Some Saturday's there are only a few, it all depends on the weather or what chores they have to do after coffee. There are older cars and brand new cars and lots of in betweens. They talk about cars, guns, home improvement jobs and other interesting things. Even though I am usually the only female there, I don't feel out of place and the fellas don't seem to mind. Uh, oh. What's that noise coming from outside? Sounds like a drill or some other power tool! Sorry, I gotta go. It might be interesting. Hmm, maybe I've got the beginnings of a new humorous Parkinson's disease song parody? 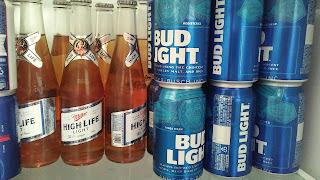 But the truth is, I never liked the taste of beer and I don't drink any other alcoholic beverages either. I have milk on my cereal and the rest of the day, I drink water. No matter how hard I try, I sound like I'm drunk. My upper lip just doesn't move like it should when I am speaking. Try putting a wad of gauze or a big piece of chewing gum between your teeth and your upper lip and then try talking. It isn't easy, is it?? And this isn't my only speech problem. I also have a difficult time speaking in complete sentences. In some ways, my speech is reverting back to how you speak as a toddler. I will want to blurt out something like, "Hey, why don't we go to DaBoyz for lunch today" and instead it comes out, "Go Boyz lunch." It's extremely frustrating to me. On top of those two problems, I also have a chronic frog in my throat, so sometimes the first few words I do get out sound scratchy. I am always clearing my throat. Add in a loudness issue and you can imagine how badly I sound. Then I saw an advertisement for a research study testing interaction via the internet with the SpeechVive device. SpeechVive is a device that you wear in one ear. It makes a babbling noise whenever you speak and stops when you stop. The premise is that you will speak louder because your brain will try to talk over the noise. Louder might also be clearer. I promptly signed up. I qualified for the study and they sent me a left-ear device, computer cords, a tape measure, a USB microphone, reading material, cartoons and instruction sheets. 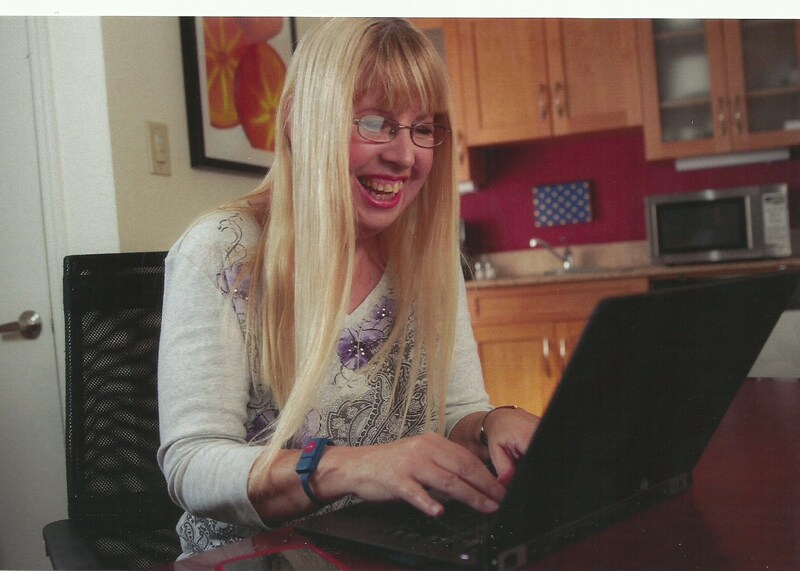 I met with my online speech therapist in early January. Brianna had me set up the microphone exactly 12 inches from my mouth (hence the tape measure), take a deep breath and say Ahh for as long as I could. The she had me read a two page story about rainbows WITHOUT the device in. Then she had me put the device in my ear with the computer cord attached. She set the loudness of the babbling noise and adjusted when it would start and stop. Then she had me do the Ahh again and read the rainbow story again with the device in. I definitely spoke louder. Then I had to make up stories, lasting 2 minutes, to go with the cartoons provided. Who would have thought I would EVER have trouble talking for 2 minutes about anything?? I agreed to wear the device daily and to talk a minimum of three hours a day, even if it meant reading out loud to Parky Raccoon and his friends Miss Bacon, Jerry Giraffe and Parky Penguin. They mostly paid attention and didn't interrupt me too much. I did as I was instructed and had friends ask me if the thing in my ear was one of those Bluetooth cell phones or if it was a hearing aid. I tried my best to explain that it was to help me speak louder, but I don't think they understood. Most people don't know that Parkinson's affects our voices, too. After six weeks, I had another online session with Brianna. Again I did the Ahh and rainbow story with and without the device and I was louder than the first sessions. We did the make up a two minute story about the same cartoons and then she just had me talk for two minutes about any topic. I chose talking about the years my Wonderful Husband and I travelled in a RV. She gave me some exercises to do about the upper lip rigidity and I agreed to continue to talk 3 hours a day. Six weeks go by, and I have another online therapy session with Brianna. Once again I do the Ahh and read the rainbow story with and without the device and my voice is louder. We do the cartoons and a topic of my own (this time I tell her about my flight stories.) At the end of this session, she informs me the research study is done. A few days later, the research coordinator contacts me and wants to know if I want to purchase the device for my own personal use or return it. I choose to return it. While it did trick me into talking louder, it didn't help with the other problems I have. I mostly ended up sounding like a loud drunk with a bad cold. I will have one more follow up session, three months from now. I am still trying to facial exercises and have turned up the humidifier in my bedroom at night to see if I can help the scratchy throat. If you have Parkinson's disease, you should get to know your friendly drug dealer, also known as your pharmacist. They know more about Parkinson's medications, side effects, as well as food, drug and supplement interactions than even the best Movement Disorder Specialist. Why? Because that's their job. 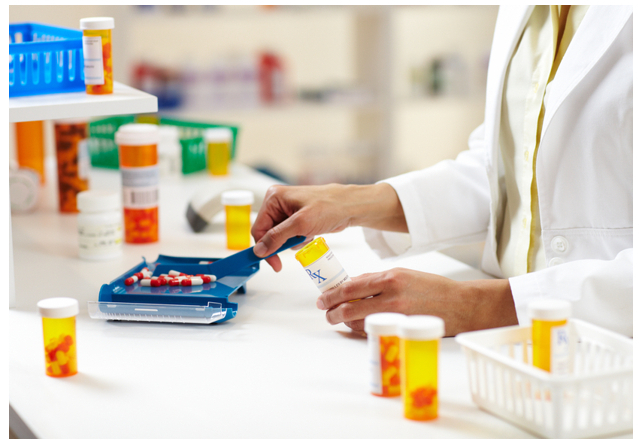 A local pharmacist named Kirti spoke to our Parkinson's support group. He used words we could all understand and even had a sense of humor. Who knew pharmacists could be funny? They always look so serious behind those partitions. Or maybe they are just working hard. 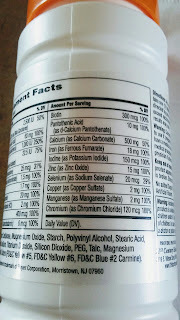 Another lady asked about calcium supplements for osteoporosis and PD med interactions. He said, do not take more than 600mg of calcium at one time because your body cannot absorb more than that. Also, be sure to spread the doses out during the day. 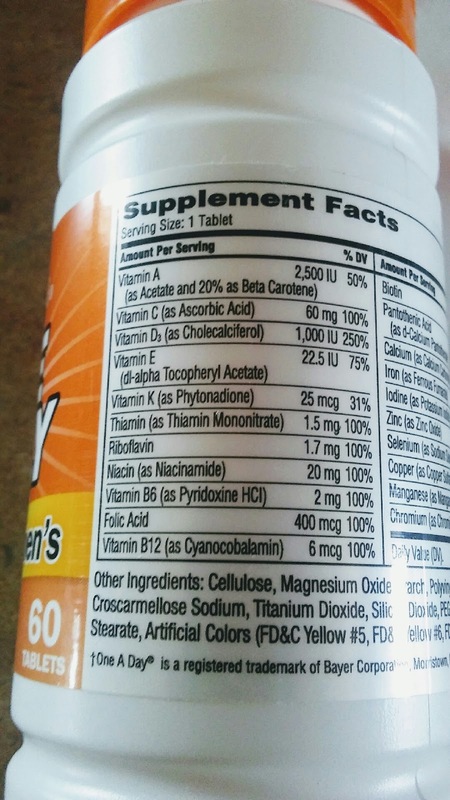 Buying those 1200mg tablets is wasting your money. 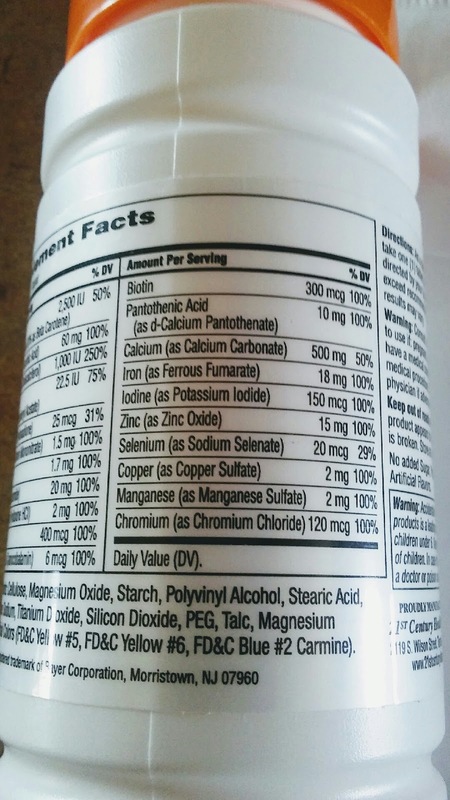 He also stated that many minerals found in supplements (calcium, magnesium, aluminum, iron) can bind to the carbi/levodopa (Sinemet) and may interfere with its absorption. So if that one particular dose of Parkie meds doesn't seem to work as well, did you take it with that multivitamin? It's best to use the two-hour rule: take minerals two-hours before or after taking your Parkie meds. I guess we better dig out our magnifying glasses and read the fine print on ALL the over-the-counter supplements we take. A man complained of morning dizziness. He said he takes his Sinemet as soon as he wakes up and then feels lightheaded for an hour or so. The pharmacist explained that our heart rate and blood pressure drop while we sleep and the Sinemet may also cause a blood pressure drop, and that might be the cause of his dizziness. He suggested the man move around some and wait an hour or so before taking the Sinemet. If that doesn't work, tell your Parkie Doctor. Another lady complained about the high cost of one of her medicines. She said a one-month supply of rasagiline was over $600. The pharmacist whipped out his smartphone, used his GoodRx.com app, and found her a price of $172 at Walmart. (One of his competitors.) RxOutreach.org has good prices as well. He also warned her to avoid foods with tyramine while taking rasagiline or selegiline. Foods like: cured, fermented, air dried meats and fish, aged cheeses, sauerkraut, kimchi, red wine and tap beer. There was an audible groan in the room, right after he said wine and beer. Another person asked about excess saliva and drooling. He said there is a drug that may help dry up the saliva, but that it may also cause constipation, which can already be a problem with Parkinson's. Someone asked how to get info if you use a mail-order pharmacy like RxOutreach.org or through the Veterans Administration? He said any pharmacist will gladly answer questions about any medications, including over the counter ones, even if you get them elsewhere. 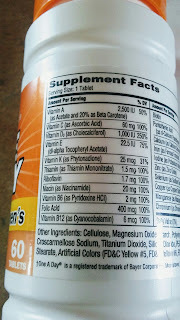 Then people began to ask about other non-Parkinson's related medications. Heck, while we had him captive, we might as well get all our questions answered. Finally, he was asked if he could recommend a local physician for Parkinson's treatment. His answer was "Just like all Parkinson's medications have side effects, so does living in Yuma. The weather is great, people are friendly, but limited access to specialists is the side effect." Get to know your local drug dealer, they can answer your questions and who knows, they may even make you laugh. Where the Heck is Yuma? There are many people who LIVE in Arizona who don't have a clue where Yuma is, so don't feel bad if you don't know. 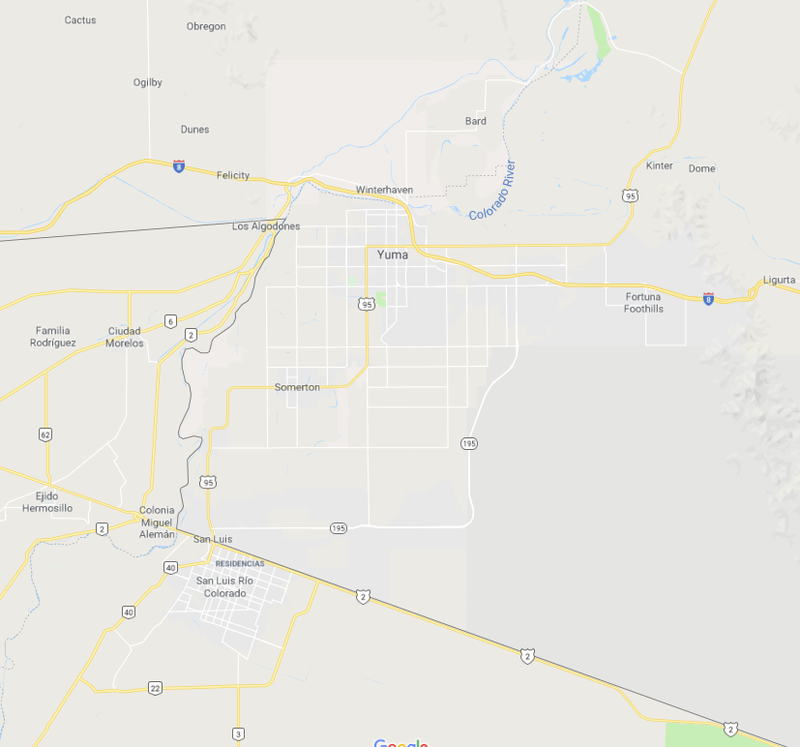 Yuma (pronounced YOU-mah) is in the southwest corner of Arizona. Occasionally, someone will call it YUMM-ah, which I find humorous. The Colorado river separates Yuma from California. 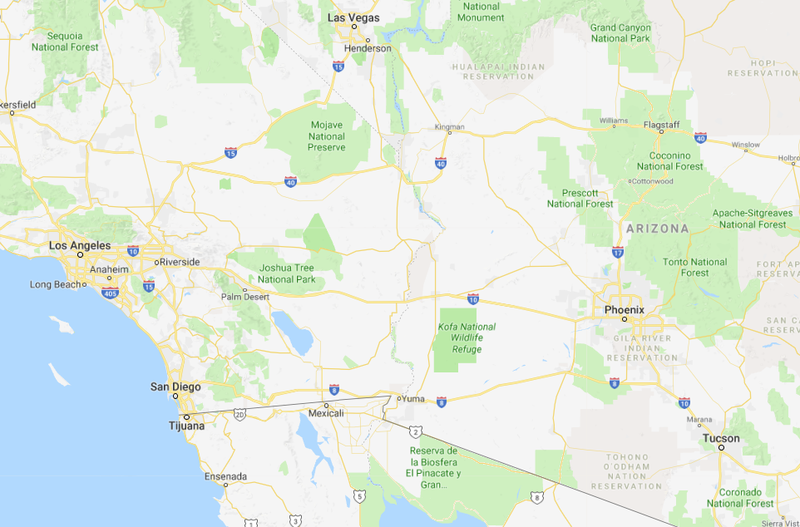 The border with Mexico is just 7 miles from Yuma at the closest point, although you have to go into California to cross that border legally. On the map below, the towns of Bard, Winterhaven & Felicity are all in California. Los Algodones is in Mexico. 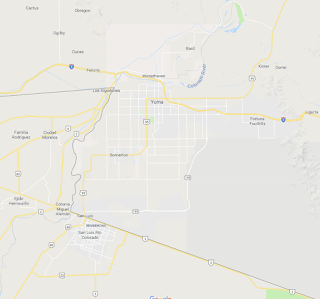 There are towns called San Luis in both Arizona and Mexico. 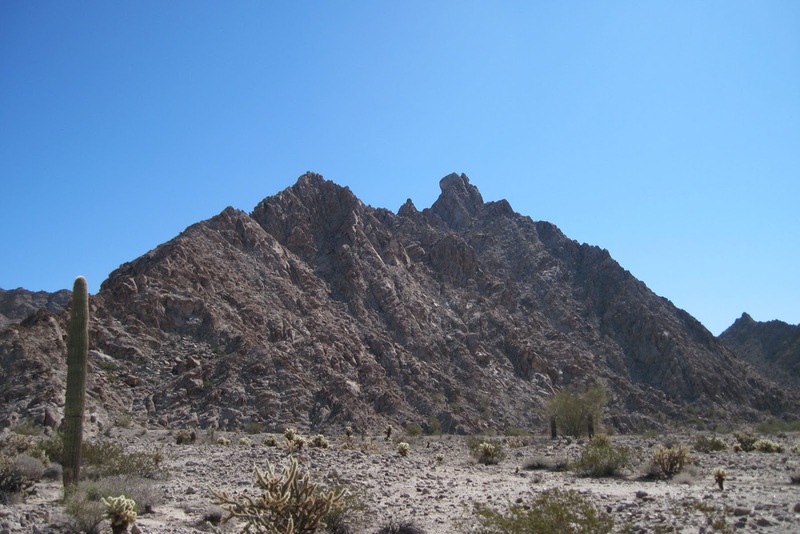 I live east of the Yuma City limits in the area called Fortuna Foothills. The closest Movement Disorder Specialists are in those large cities, so travel to see one becomes more difficult as our disease progresses and when we most need their expertise. When I tell people that I live in the desert, most think Yuma looks like these giant sand dunes, but they are about 30 miles west of Yuma, in California. 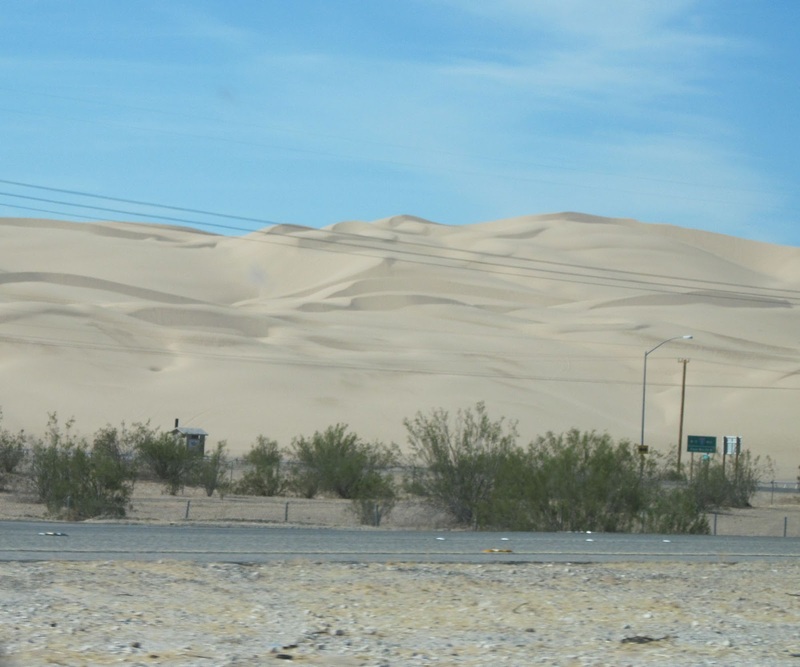 In reality, most of the undisturbed areas around Yuma look like this. 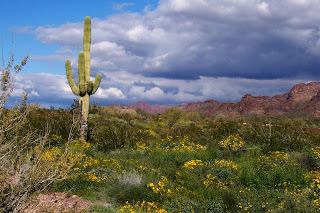 Unless we get an exceptionally rainy Winter and then the desert looks like this. This was back in 2004-2005. We are the sunniest city in the USA with an average of 4133 hours of sun yearly. Some hotels guarantee sunshine or you don't pay for the night! Our airport has the longest civilian runway in the USA at 13,300 ft. The runways are shared by the military, commercial aviation (American Airlines) and private planes. We are the driest city with average rainfall 2.94 inches. The wiper blades on our cars disintegrate due to lack of use. And if it does rain, we have to hunt to figure out how to turn the wipers on. Yuma is home to a Marine Corps Air Station, where F-35 Lightning II fighter jets train. 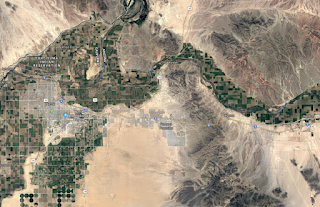 It is also home to the US Army Yuma Proving Ground, one of the largest military installations in the world, where all types of weapons, munitions and unmanned aircraft are tested. Living here is like having an air-show every day! General Motors also has their desert test track here, so we often see the newest versions of the Corvette and Camaro driving around in their camouflage wraps. It's never a dull moment. But probably the most surprising thing about Yuma is how much we grow. Yuma is the Winter lettuce capital of the World (iceberg, romaine, leaf, baby leaf, spring mix, spinach.) Yuma county is large, over 5500 square miles and is larger than the state of Connecticut. It has some of the most fertile soil in the world and a thriving agriculture industry due to irrigation canals fed from the Colorado river. 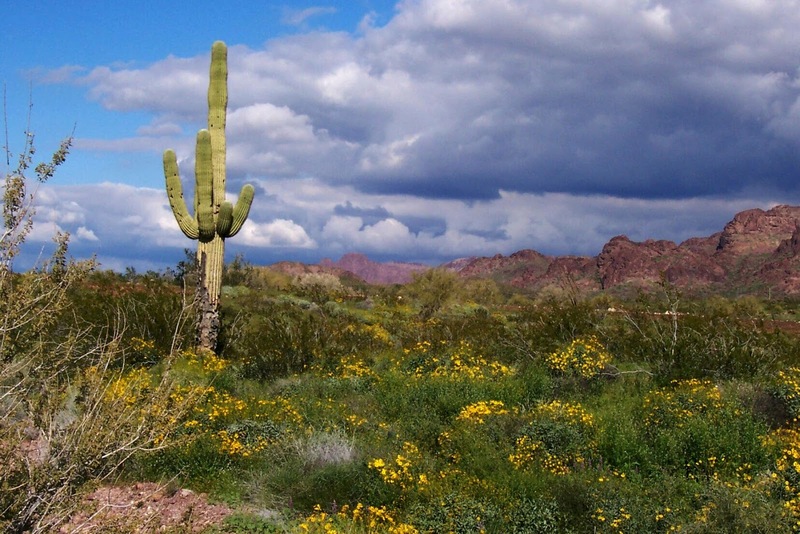 There are over 175 different crops grown in the Yuma area year round! The list includes alfalfa, Bermuda grass seed, cotton, Medjool dates, lemons, tangelos, tangerines, watermelons, cantaloupes, broccoli, cauliflower, celery, red & green cabbage and wheat. Desert Durum wheat accounts for 95% of wheat grown in Yuma County, and about two-thirds of that is exported to Italy for use in making premium pastas. Another unique fact about Yuma County is that some growers also cultivate kosher wheat to be used by Orthodox Jews to bake matzo. Our farmers stay busy year round. A drive past the farmland is an ever changing patchwork quilt of varying shades of green. Even though it's a long drive to see my Parkie Doc, I'm happy to call Yuma home and proud to be called YumaBev! 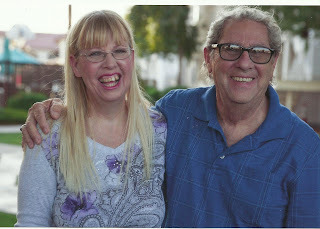 My Wonderful Husband and I will be flying to Los Angels and then to New York City at the end of April to participate in some Parkinson's disease related events. There's just one small problem. We both hate flying. We are NOT afraid of flying. It's just that whenever one of us gets on a plane, something always goes wrong. I don't think we have EVER had a flight go perfectly. In fact, I will tell you some very humorous stories about our past flight adventures. Though, they didn't seem funny at the time. 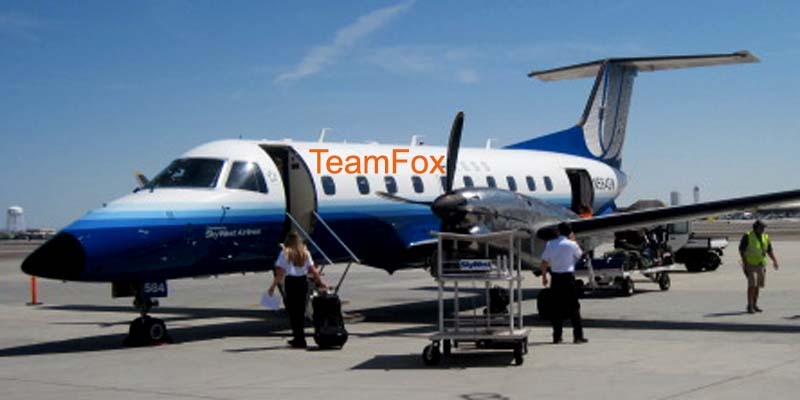 After writing these stories down, we decided to make THIS flying adventure a TeamFox fundraising event! It is about 5000 miles round trip from Yuma to New York City. That's 10,000 flight miles total for the two of us. I am asking you to sponsor a mile for $5.00. If we can get every mile sponsored, it will raise $50,000 for the Michael J Fox Foundation for Parkinson's disease research! Please read about our past flight adventures, laugh at them and then donate! 1. Shortly after we got married 32 years ago, my Wonderful Husband earned a trip to Las Vegas, Nevada as a bonus from his job. It was a long weekend, fly in on Thursday and back home on Sunday. Our flight went well, until we got to baggage claim. Hubby's bag was there, but mine was not. Mine was on its way to Seattle, then Chicago and finally got back to Las Vegas on Sunday afternoon, just in time to fly back home to Orlando. I ended up wearing the same pair of jeans all weekend and borrowed a tee shirt from Hubby. 2. A year or so later, my Wonderful Husband earned a weeklong trip to Paris, France. We would be traveling with a group of about 15 other couples, all flying in from different airports to our international departure airport in North Carolina. We got to the Orlando airport with plenty of time to spare before our 9 am departure time. When we checked in at the airline counter, we were informed that our plane was about to leave without us! The flight departure time had been changed and we were never notified. We were too late to check our luggage, and we would have to RUN to get to the gate, carrying all of our bags with us. We could hear them mispronouncing our names over the PA system as we sprinted down the meandering halls. Thankfully, I used to work at the airport, so I knew every shortcut. The plane was already backed away from the gate, but they opened the door, and we scrambled up the stairs. We were red-faced from running and embarrassed for holding up the flight. When we got to North Carolina, the group director apologized for not telling us about the time change. 3. Wonderful Hubby and I decided to take a trip on our own. 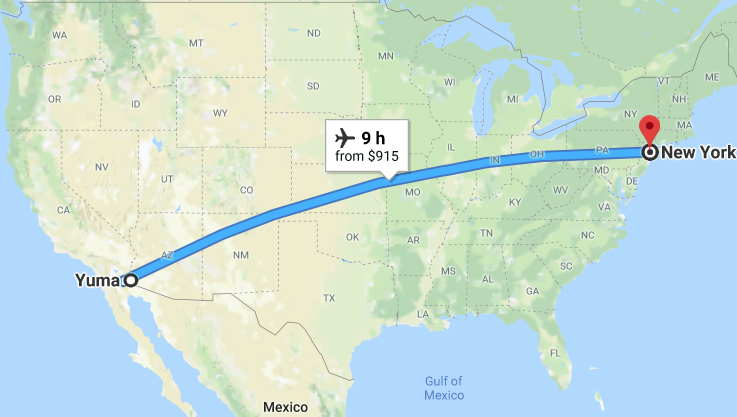 We would fly from Orlando to San Francisco, rent a car, drive down the coast to San Diego and fly back to Orlando. We had a hotel reserved near the airport and dinner reservations at The Brown Derby. We get to San Francisco and it's fogged in, so we land in Oakland. We had to take a bus to the San Francisco airport and finally arrived at 10 pm. We still had the hotel, but we had missed our dinner reservation. It was well after midnight before we got to eat. 4. Two years later, Wonderful Hubby earned a trip to Hawaii. This time we would be flying out of Orlando with Hubby's boss and his wife. Let's call them Mr. & Mrs. Paul. We knew the Paul's very well and we socialized together often. We even drove to the airport with the Paul's. Also on this trip was another employee and her husband, we will call them Mrs. & Mr. Jones. 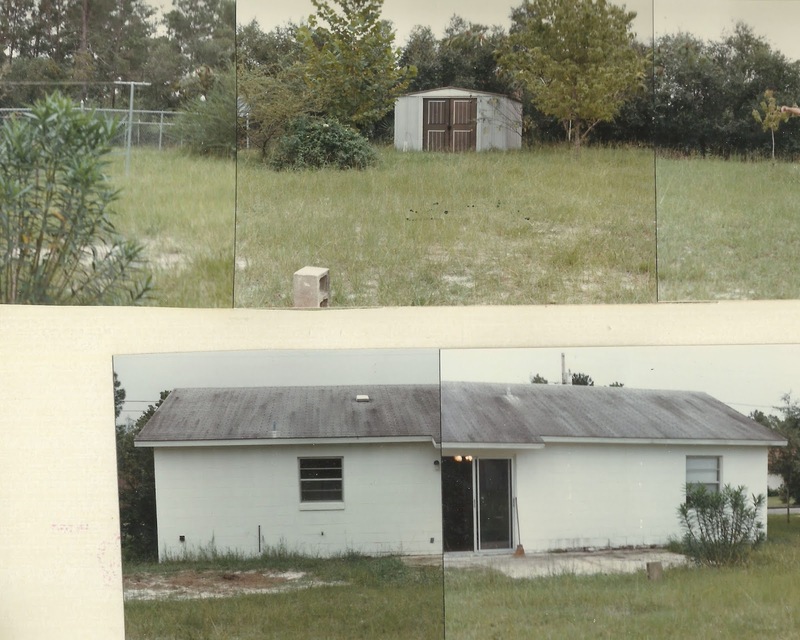 We didn't know the Jones' at all, they lived in a different part of Florida. Our flights to Hawaii went okay, although the Island hopper plane from Honolulu to Kauai almost ran off the end of the runway. Four days into our weeklong trip, Mrs. Jones is sick and throwing up. It turns out that she is pregnant! Mrs. Paul plans an impromptu celebration. Yippee! And then everything goes wrong. Mr. Jones wants to know who the Father is, because he knows it isn't him. What we didn't know was that Mr.Paul had a thing going on with Mrs. Jones. Yes, you guessed it. Mr. Paul was the Father. Needless to say, the rest of the trip was rather tense, the flight back to Orlando with all of us sitting together was downright stressful and driving the Paul's back to their home after, well, thankfully, was very, very quiet. Wonderful Hubby retired shortly after this, and it was over a decade before either of us ever got on a plane again. 5. The next time I flew was when we were working at a RV resort in western Colorado. It was just after the 2001 World Trade Center attacks and I wanted to go visit my Dad in Orlando. Most people were afraid to fly, and airfares were cheap. I'd have to catch a regional flight to Denver and from there, I'd fly non-stop to Orlando. When I got to Denver, I found my non-stop flight had been cancelled. I never knew exactly why, but my guess is that there weren't enough passengers to make the flight profitable. I still got to Orlando, by way of Salt Lake City, which is the opposite direction from Orlando. What should have been a four hour flight ended up taking over eight. 6. It would be several more years before we dared to get on another plane. We had moved to Arizona and wanted to fly back to Orlando to visit family. We were not living in Yuma then, we lived about 30 miles away in a small town called Wellton. Friends offered to drive us to the airport and pick us up. Our flight left Yuma at 7 am and our return flight got in at 4 pm, so we accepted their offer and thanked them. Come fly with me.....or maybe not! Our flight to Orlando went perfectly. Our flights back went good too, until we got to Phoenix. 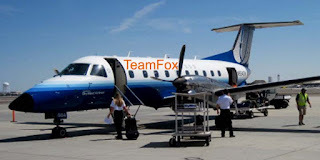 As we sat at the gate waiting to board the 3 pm regional jet to Yuma, other passengers began to arrive. The plane was parked at the gate, but there were no employees to be found. Three o'clock came and went, still no one from the airline showed up. We checked the departures board and it said "delayed." We called our friends and told them not to drive to the Yuma airport until we called them back. Four o'clock came and went, then five and six. An employee showed up, made an announcement that there was a "technical" problem and disappeared. Meanwhile, the passengers waiting at the gate kept increasing, as the folks scheduled for the 6:30 pm flight arrived. Seven o'clock ticked past, as did eight and nine. The 10 pm flight passengers joined the rest of us waiting at the gate. We called our friends and told them we had no idea when or if the flight would leave. They said they'd wait to hear from us. At 11 pm the employee showed up, said there was still a "technical" problem but said our flight should leave at 1 am and disappeared again. IF the flight left at 1 am, it would be 2 am when we got to Yuma, way too late for our friends to come get us. So I called the Yuma airport to see if we could rent a car. Sorry, all the rental companies were already closed. I even asked the other passengers if any of them lived in Wellton, no was the answer. We had no choice, our friends would have to come get us. Around midnight, several more "passengers" showed up. They were all similarly dressed. By the time the plane left at 1 am, it was completely full. The late arriving passengers were the flight crews for the next day's flights. This was the "technical" problem. We were aggravated, but it was comforting to know that there were several extra pilots, co-pilots and flight attendants on board. This was our first experience in learning how flight crews get to work...they fly! PS It was 3 am before we finally got home, and yes, our friends are still our friends, although they never offered to drive anyone to the airport again. 7. 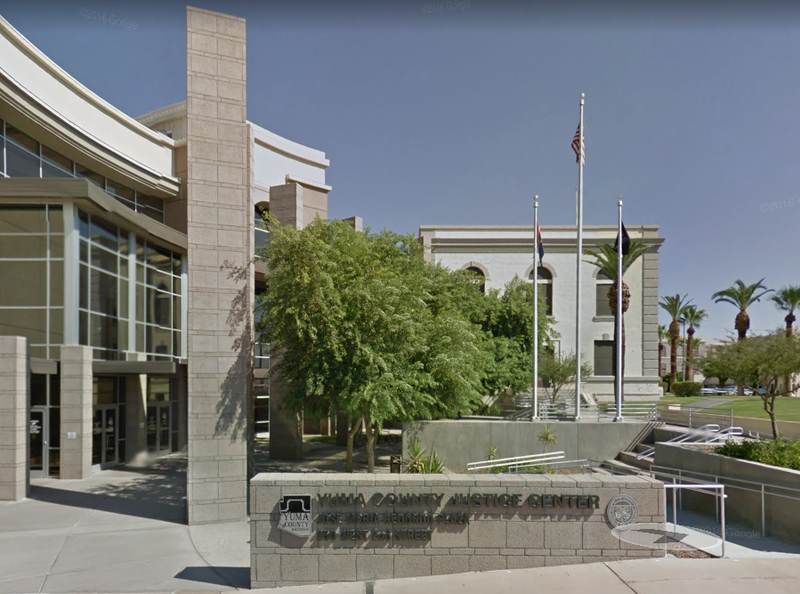 Flights from Yuma cost significantly more money, and with our previous experience, the next time we flew, we decided to skip the regional airport and drive directly to Phoenix, which is over three hours away. My still undiagnosed Parkinson's was quite debilitating by now, so we chose an easy to find, offsite valet parking with shuttle service. All went well until we got back. Our car was blocked in by another car and they couldn't find the keys. We had to wait for a tow truck to come move the other car. 8. 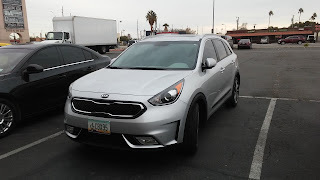 The next time we flew out of Phoenix, we rented a car, one-way from Yuma to get there. We went to pick up our reserved small SUV (easier for me to get in/out of) only to find they had none available. We had to take what they had, which was a mid-size sedan. The passenger seat was so low, I couldn't see out the front windshield, I felt like I needed a booster seat. Wonderful Hubby had to pull me up out of the car at every rest stop. After this, we decided to give up flying, it was just too uncomfortable. 9. Many years go by, I've been diagnosed with Parkinson's, started this blog, wrote the book and then I get invited to speak at a Parkinson's conference in New Orleans in April 2013. I am scheduled to have DBS brain surgery six months before the date, so I say yes. We decide to fly from Yuma again; the Yuma airport only has one gate, so it's easier. This time we fly from Yuma to Los Angeles and then to Houston and New Orleans. I am short and thin. Wonderful Hubby and I both book aisle seats, across from each other, so he can help me if needed. The airline seats seem to have shrunk since our last flight. My knees are up against the seat in front of me and I can't put my arms down by my side. The gentleman next to me is tall and he must sit with his knees wide apart. These airplanes are equipped with TV screens in the backs of the seat in front of you; probably to distract you from how cramped you are. All during our flights, they kept running a commercial on the little TV's for this airlines air cargo service. They kept showing expensive antiques, delicate flowers and exotic animals and stating how your items would travel in a safe and comfortable environment. I joked to the tall guy, that next time, maybe we should fly air cargo instead. I spend most of the flight standing up in the back of the plane near the flight attendants area. We decide that from now on, if we can't drive there, we won't go. But New York City is too far to drive and there's no place to park even if we did. So, I wonder what will happen on this upcoming trip? Let the FUNdraising begin! Don't let the $50 or $100 buttons scare you, just press "OTHER" and choose your own amount! 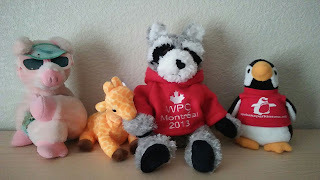 PS Our flights went well, we made all our connections and we had a fabulous time with the other Parkies. Thank you to all who donated to the cause. Parkinson's Humor, the book, is now available online. Sherryl Klingelhofer, from Tillamook Oregon is a Master Fitness Trainer. 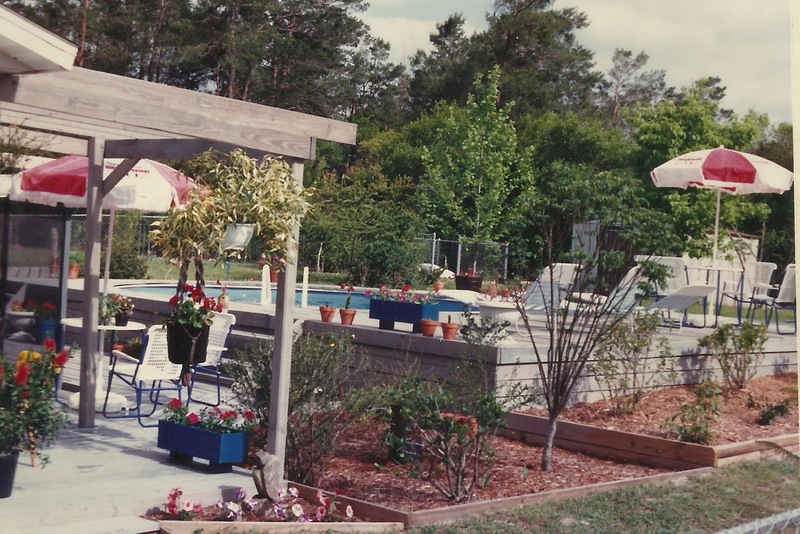 Her Father had Parkinson's, so she developed certain exercises to help him. Now she makes videos of Parkinson's Specific exercises to help others with Parkinson's. Here is the link to her YouTube channel. IF you don't want to click on the link, just type her name in the YouTube search box. 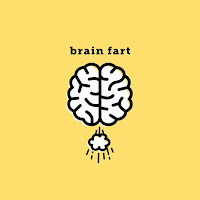 Unless otherwise indicated, all information contained on this Web site, such as text, graphics, logos, button icons, images, audio and video clips, is copyrighted by and proprietary to Beverly Ribaudo and Parkinson's Humor. 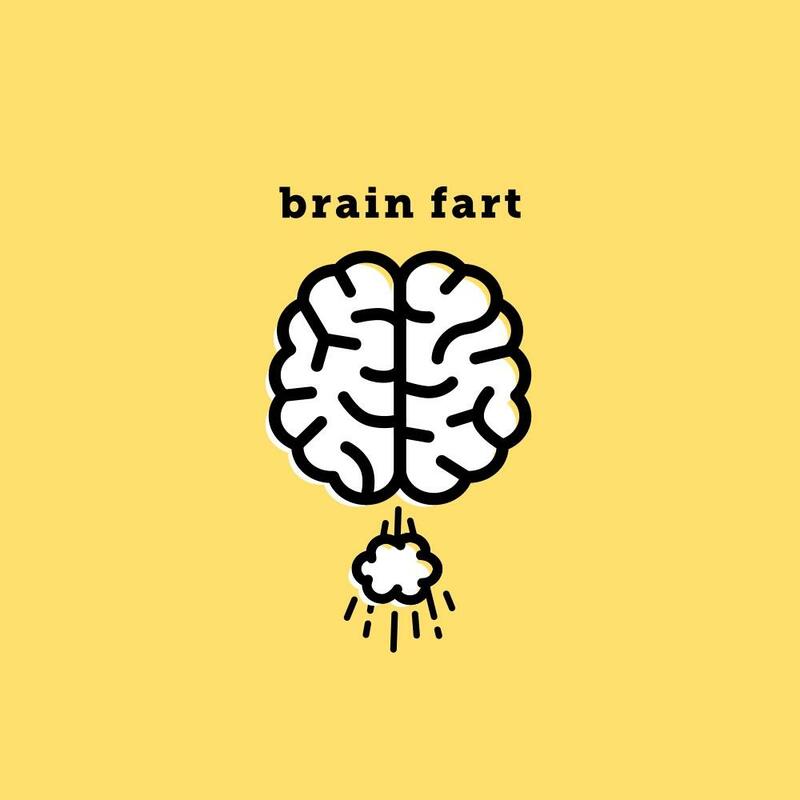 The content displayed on any page of this Web site may be used for personal and noncommercial uses which do not harm the reputation of Beverly Ribaudo or Parkinson's Humor, provided that the user does not remove any trademarks, copyright and any other notice contained in such content. ©Beverly Ribaudo 2011, 2012, 2013, 2014, 2015, 2016, 2017, 2018, 2019. My name is Bev Ribaudo and I was diagnosed with Parkinson's Disease at age 47, but my symptoms started in my 30's. Humor comes naturally to me and a little disease like Parkinson's can't take it away. I have been married since 1985 to the most Wonderful Husband in the whole world. I like Photography and Karaoke. IF you think you might have Parkinson's, check out these sites.